Wall Street Journal writers William Mauldin and Jacob M. Schlesinger fleshed out more details on the observation made by the veteran GOP lawmaker in an article in yesterday’s Wall Street Journal. “Republican lawmakers are showing increasing resistance to President Donald Trump’s trade agenda, worried that his plans could hurt exports from their states and undermine longstanding U.S. alliances,” Mauldin and Schlesinger stated. 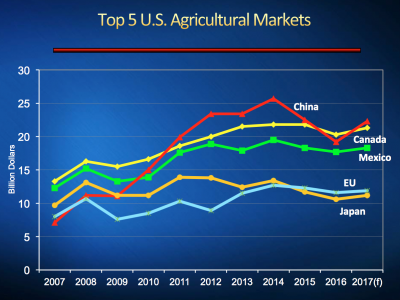 A recent graph from USDA’s Foreign Agricultural Service pointed out that the top destinations for U.S. agricultural exports are China, Canada, Mexico, the EU, and Japan. “While many Democrats in Congress are interested in working with the Trump administration on trade, Republicans who have long backed free trade—many of them close to business groups—are warning that imposing tariffs could lead to retaliation against U.S. goods. Lawmakers from farm states are upset that Mr. Trump in January pulled out of the unratified Trans-Pacific Partnership, or TPP, the 12-nation trade agreement that Barack Obama negotiated,” the article said. 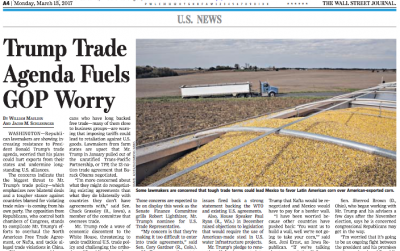 An article in Monday’s Wall Street Journal highlighted the concern of some GOP Senators with President Trump’s trade agenda. More specifically on NAFTA, which has facilitated greater agricultural trade between the U.S., Canada and Mexico, the Journal writers stated that, “Mr. Trump’s pledge to renegotiate Nafta is expected to provide an early test of congressional support for his policies. U.S. lawmakers took note when a Mexican lawmaker introduced legislation favoring Latin American products over American-exported corn, a key winner in Nafta. That move followed warnings from Mr. Trump that Nafta would be renegotiated and Mexico would have to pay for a new border wall. With respect to some technical details regarding NAFTA, Bloomberg writer Andrew Mayeda reported last week that, “The U.S. government probably won’t begin ‘real’ negotiations to revamp the North American Free Trade Agreement until later this year, Commerce Secretary Wilbur Ross said. 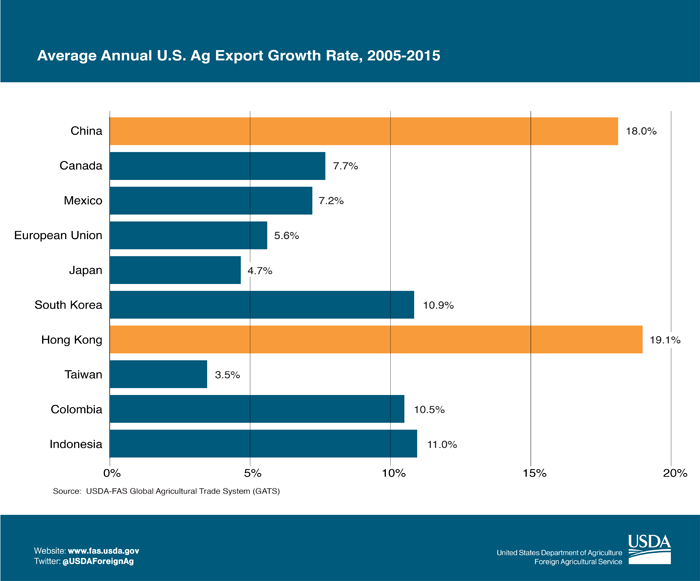 From 2005 to 2015, the average annual U.S. ag export growth rate for Canada and Mexico was over 7 percent. 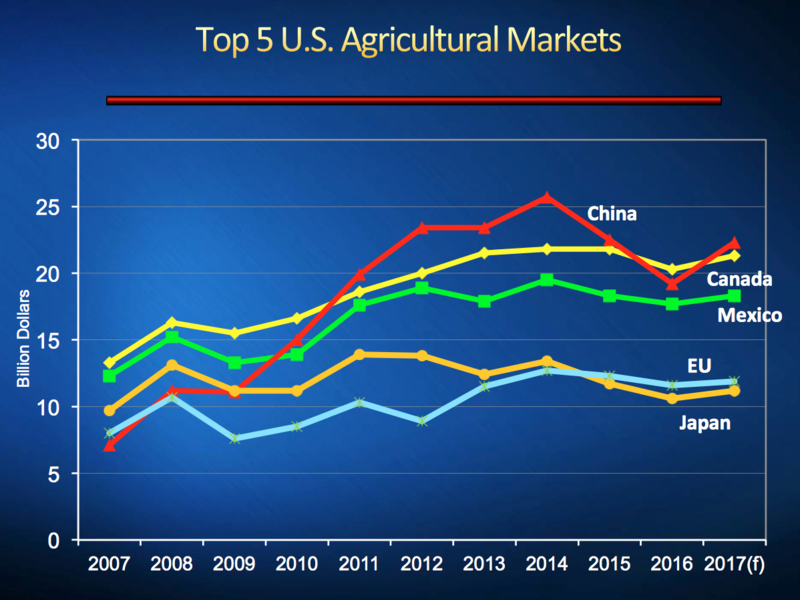 (Graph from USDA’s Foreign Agricultural Service). The Bloomberg article also explained that, “Ross said the Trump administration is having ‘preliminary’ discussions with U.S. lawmakers about Nafta, but hasn’t given Congress official notice that it will start negotiations. Under the law that hands the president so-called fast-track authority on trade pacts, Trump must give Congress 90-days’ notice that he intends to revise an existing agreement. Before starting talks, he must lay out the administration’s goals and consult with key committees in the House and Senate. Meanwhile, Shawn Donnan and Demetri Sevastopulo reported on Friday at The Financial Times Online that, “A civil war has broken out within the White House over trade, leading to what one official called ‘a fiery meeting’ in the Oval Office pitting economic nationalists close to Donald Trump against pro-trade moderates from Wall Street. The FT article stated that, “Mr. Cohn has also been featuring more prominently in discussions over the renegotiation of the North American Free Trade Agreement with Canada and Mexico, one of Mr Trump’s top trade priorities. 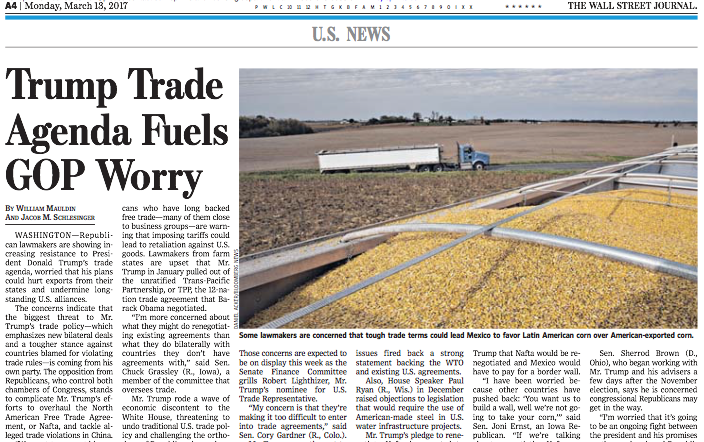 As the trade policy debate unfolds, Bloomberg writers Alan Bjerga, Blacki Migliozzi and Cindy Hoffman provided a closer look at agricultural export issues in a global context in an article from yesterday. 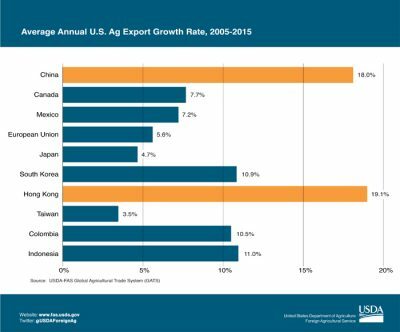 “For many years, U.S. dominance as the top agricultural exporter has been slipping even as rising sales have allowed producers to prosper. Simply put, other countries have been able to catch up as they develop more farmland and improve their own trade prospects. Now President Donald Trump’s aggressive positions on U.S. trade relations threaten to worsen the relative decline of U.S. exports, as countries look elsewhere for agricultural products,” the Bloomberg writers said. ‘If a trade war led to the U.S. being less able to sell its soybeans or wheat, you would find quickly that the rest of the world would say, ‘thank you.” [Joe Glauber, a former chief economist for the USDA ] said. More trade perspective from the executive and legislative branches can be expected on Tuesday as the Senate Finance Committee holds hearing to consider the nomination of Robert Lighthizer to be United States Trade Representative.